Design Thinking and Pick Axe’s | Juice Inc.
One of the core principles of innovation is synthesis, which is defined as “bringing two or more entities together to create something new”. Since I made yesterday’s Innovation of the Day Pickaxe post, I’ve had exactly that experience. I had emailed my friend + designer Ed O’Connor (eOleo Design, http://www.edoconnor.info) my sketch of the new pick-axe design, and he in-turn went online to see if he could find an ergonomic pickaxe. 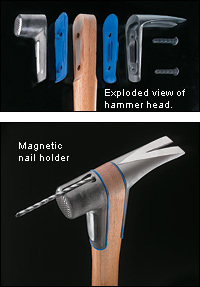 He didn’t but instead sent a link to Lee Valley Tools, and a framing hammer that prompted some more specific ideas for shock-absorption http://www.leevalley.com/en/wood/page.aspx?p=58697&cat=1,53193. Based on that picture (note the blue padding in the exploded view of the hammer head) I sketched the following detail for my pickaxe design. One of the nice features of a traditional pick-axe is that head slips onto the shaft from the bottom, and can’t fly off because the top of the shaft flairs out. In this design I wanted to maintain that feature. Even if the bolt holding the shock absorption loosens, it will be held by the head. I realize that you might not actually be interested in pick-axes, but of course I’m really using this example to illustrate some basic innovation principles. Which led directly to a slot-screwdriver vs. allen-key insight. A small feature of my pick-axe design is that instead of using an allen-key to tighten the bolt that holds on the shock-absorption, I specified using a slotted-screwdriver. This comes directly out of some recent IKEA furniture dismantling experiences – where my kids couldn’t find the standard allen key. Although an allen-key is a better tool, can you find one when you need it in the back-garden? There is generally a screwdriver around however, and in a pinch you can use a table-knife or a dime, because this slot will be designed to be large enough to accommodate either. The point here is simple – innovate with the user in mind. 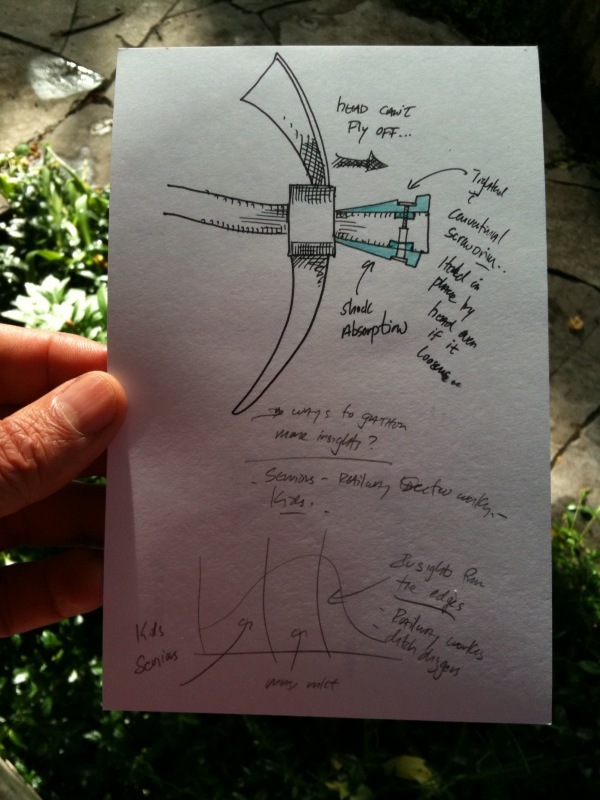 You might have noticed the Bell Curve diagram at the bottom of the sketch. We’ll explore that in the next post. Until then, take care!